"I thoroughly enjoy the creative process involved in forensic animation." Chris Rohlfing, Forensic Animator, has been with DELTA |v| since 2016. Before joining DELTA |v|, Chris held a position developing instructional animations for the U.S. military. The materials taught service members how to use drones to identify people on the ground in Iraq. Chris applies these skills to his work at DELTA |v| by using advanced software to create animations that help attorneys (and the juries they speak to) understand how an incident unfolded. 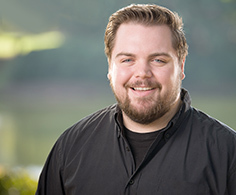 Chris holds an Associate’s degree in Simulation and Game Development from Central Piedmont Community College, as well as a Bachelor’s degree in Computer Animation from Full Sail University. Chris has always enjoyed the creative process and technology. “I believe it first struck me when I was a little kid watching Bob Ross paint his “Happy Little Trees.” I also have a deep connection with technology. Combining the two was only natural for me,” Chris said. When he is not cranking out awesome animations at DELTA |v| or studying for his degree, Chris enjoys camping and hanging out with his wife and friends.